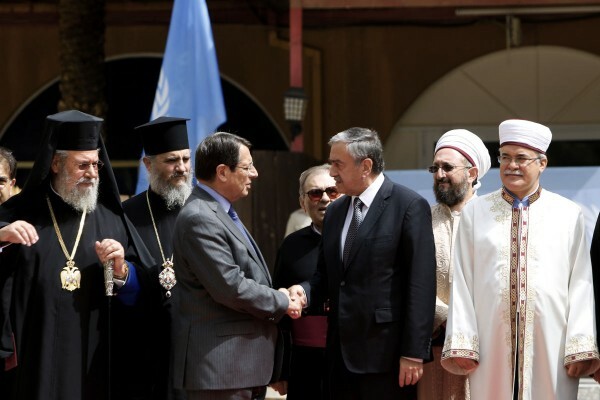 NICOSIA, Cyprus (AP) — Talks between the heads of Cyprus' Christian and Muslim communities and the leaders of the ethnically split island's Greek- and Turkish-speaking communities give "great hope" that religion can better contribute to peace, an official said Thursday. Religion has never been at the root of the Cyprus conflict, said Peter Weiderud, who heads a Swedish Embassy-sponsored program that aims to get Cyprus’ religious leaders more actively engaged in peace-building. But religion and the right to freely worship have become victims of it. More than 500 churches and monasteries — many hundreds of years old — were left to ruin, looted or converted for other uses in the breakaway Turkish Cypriot north of the island after Turkey invaded in 1974 and split the island along ethnic lines following a coup aiming at union with Greece. In the internationally recognized south, only a fraction of the 110 mosques operate. The meeting which Weiderud said is the first of its kind in Cyprus offers a rare example of Christian and Muslim religious leaders banding together to promote peace in a region engulfed in war and violence often underpinned by sectarian hatreds. Greek Cypriot President Nicos Anastasiades and breakaway Turkish Cypriot leader Mustafa Akinci met Thursday with the heads of Cyprus’ Orthodox Christian, Armenian, Maronite and Latin Catholic churches as well as the Turkish Cypriot Grand Mufti. Very few church services were held in the north after the island’s division as the two communities had virtually no contact until 2003 when crossings opened. But the past year has seen a spike in Christian faithful flocking to abandoned churches to worship for the first time in decades.